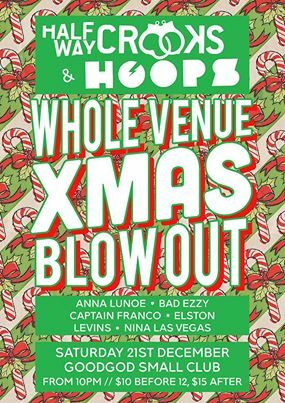 GOODGOD Small Club ~ HALFWAY CROOKS X HOOPS XMAS BLOWOUT! HALFWAY CROOKS X HOOPS XMAS BLOWOUT! Two of the Sydney’s best parties and six of Sydney’s most fun DJs are coming together for a night of insane merriment! Hoops x Halfway Crooks is coming to Goodgod Small Club for a Xmas blow out on December 21st. They are will be taking over the whole venue for one night of mega shindig! Featuring Anna Lunoe making her return from LA, with her first set at Goodgod in almost a whole year – along with her Hoops compadres Bad Ezzy and Nina Las Vegas. Representing Halfway Crooks, the rap party for party people, are Captain Franco, Elston and Levins. Both crews will be playing back to back and head to head in both the front bar and the back bar – a mix of rap, new club hits, R&B and classic bangers. Cancel that pre-Christmas dinner (or re-schedule it to The Dip before the party starts!) and come and join Halfway Hoops for the Xmas blow out to end all xmas blowouts! !